1.Thank the blogger that nominated you. 2.Nominate 5 – 10 bloggers to pass the award to. 4.Inform your nominees and post a comment in their blog to let them know they’ve been nominated. I consider it a great honor to be nominated for this award. My blog started as an effort to share my thoughts on the faults and dangers of religion, specifically how my experience with domestic violence opened my eyes to the similarities between an abusive relationship and a relationship with the God of any standard religious institution. I wanted to have a place where I could share my thoughts openly without fear and knowing that my words would be read by others who might be influenced to escape their self-enforced captivity. I wanted to share my journey, and show those still entrenched in their religious upbringing that atheism is nothing to fear- that opening their minds to the truth and their hearts to the possibilities is liberating. But in a short time, my blog has become so much more than what I initially intended. I haven’t really written as many posts on religious topics as I have reflecting on my abusive relationship, my current efforts in coping with PTSD, and on my journey in coming to terms with my self-identity. I want to help people find freedom and connection, a sense of understanding and recognition… It is my hope that what I write will be read by those who NEED to see what I’ve experienced and see that it is possible to overcome trauma. It is for this reason that I’ve titled my blog “Inform, Inspire, Inflame”, because I wish to inform the uninformed, inspire the uninspired, and inflame the hearts of the apathetic, depressed, and disconnected so that they may discover their own passions and resume their lives with vigor. In what way do you feel blogging can help people with psychological trauma or mental illness? Why would you recommend blogging to someone who suffered from mental illness? How has blogging helped with your healing, or personal journey? Do you have any advice for a person who has a hard time understanding their emotions? Writing is an extremely cathartic process, and blogging even more so. The simple act of putting your struggles to paper (or keyboard) allows you to process the pain and emotional turmoil associated with the memories that must resurface. You have to find the words to articulate it, have to think about how to break it down into sentences and structure it into something that makes sense. Taking the time to commit those troubling thoughts into written word is an opportunity to process what might otherwise remain trapped inside, and blogging it puts it out where others can see it. Others can read it. Others can comment and share. And you realize you’re NOT alone. There are others who share your pain and appreciate your efforts to put your thoughts where they can read them. Blogging can be an immense help to those suffering from psychological trauma or mental illness, because it creates a support network. You make friends. You connect with others trying to process their own struggles, writing about their efforts, and sharing their own strategies for overcoming the turmoil. You feel validated. You feel strengthened. And you help others feel the same. 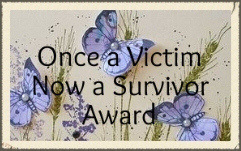 A few of my blogs were prompted by flashbacks and intrusive thoughts associated with my PTSD. Often, I find myself up with insomnia, with images coursing through my mind too quickly to follow and my emotions riding a roller coaster in response. When it gets particularly difficult, I know I have to get it out, but I wind up sitting in front of the computer screen just staring at it for hours, trying to think through the pain and find the words. Every time I write something about what I’ve been through, it’s the same, and I rarely even get one word down the first time I sit down with the intent to write it. I come back, again and again and sit and stare, until finally, the words start to form. The emotions associated with trauma aren’t easy to understand. They are raw and powerful, visceral and intense. Don’t let them build to a breaking point. Talk with someone who can listen and understand. Talk with someone who can help. And write. Writing is amazing, because not only does it help get it out and in the open, it gives you an opportunity to look back. When you finish writing, you’ll likely feel a sense of relief and with that a sense of exhaustion. A weight has been lifted. Sleep it off. Then come back and read what you wrote. This helps process it further, as when you read it, you start piecing together clues and recognizing why you were feeling so stuck before. There’s a whole world out there of people who share your pain and who want to help. You don’t have to be alone. Don’t remain a victim. You’re more than what happened to you. You’re more than your pain. You, too, are a survivor. And together, we are strong. Congratulations on your nomination! You are not alone, may you find healthy ways to cope and heal and may you always know you are brave for sharing your voice to help others recover with you! Thank you for your nomination, I am honored to be amongst the worthy nominees. Thank you for nominating my blog! And, I’m looking forward to reading more of yours. I can completely relate about the value of writing…and wanting to pass on some of your experiences to others in the hopes that it will help. I just published a blog post about having to stop blogging for a short time due to the divorce I am in. I somehow think I will be able to be back and blogging within a week – and look forward to moving forth with the nominations. What a great way to connect with others. Thanks again!